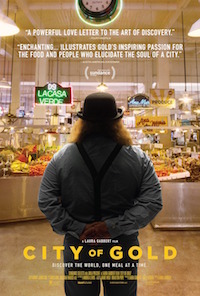 City of Gold chronicles Pulitzer prize-winning restaurant critic Jonathan Gold's deep and complex relationship with the food culture of the city, Los Angeles. City of Gold explores the rigor, knowledge and compassion that makes Jonathan's style of criticism stand apart. City of Gold offers the rare opportunity to see LA through the eyes of its foremost cultural writer and most loyal fan.